Who was the greater economist--Adam Smith or Charles Darwin? The question seems absurd. Darwin, after all, was a naturalist, not an economist. But Robert Frank, New York Times economics columnist and best-selling author of The Economic Naturalist, predicts that within the next century Darwin will unseat Smith as the intellectual founder of economics. 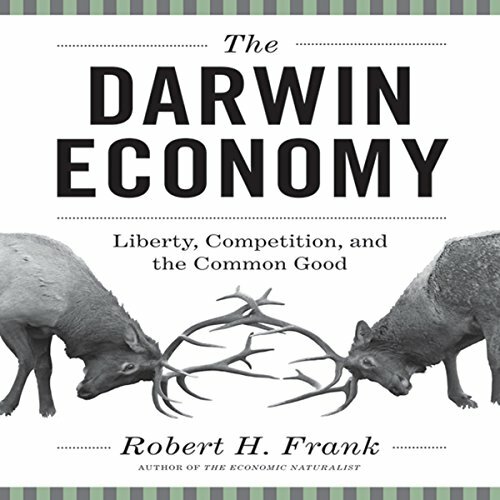 The reason, Frank argues, is that Darwin's understanding of competition describes economic reality far more accurately than Smith's. And the consequences of this fact are profound. Indeed, the failure to recognize that we live in Darwin's world rather than Smith's is putting us all at risk by preventing us from seeing that competition alone will not solve our problems. Smith's theory of the invisible hand, which says that competition channels self-interest for the common good, is probably the most widely cited argument today in favor of unbridled competition--and against regulation, taxation, and even government itself. But what if Smith's idea was almost an exception to the general rule of competition? That's what Frank argues, resting his case on Darwin's insight that individual and group interests often diverge sharply. Far from creating a perfect world, economic competition often leads to "arms races," encouraging behaviors that not only cause enormous harm to the group but also provide no lasting advantages for individuals, since any gains tend to be relative and mutually offsetting. The good news is that we have the ability to tame the Darwin economy. The best solution is not to prohibit harmful behaviors but to tax them. By doing so, we could make the economic pie larger, eliminate government debt, and provide better public services, all without requiring painful sacrifices from anyone. That's a bold claim, Frank concedes, but it follows directly from logic and evidence that most people already accept. This author suggests that Darwinian theory can be applied to economics. I agree, but he fails to make a proper analogy. The author fails because of intrinsic bias or a general lack of Darwinian understanding. While there are several points that fit, many more are presented in isolation or from a socialist (equal outcome) perspective. The whole point of Darwin's theory is that species evolve over time to better compete and to reproduce based on an individuals performance. He gets that part right. The author fails to consider in his arguments that ecosystems evolve as well. They are dynamic, not static and that a prospering individual will move the entire population toward prosperity even though some will fail. In fact, it is essential for weaker individuals to fail for the entire species to advance over time. He misses this point entirely. In the case of his rank order value assessment, he states the the higher ranking individual should pay for that rank and shift income to the lower rank individual. He argues this on the basis of fairness and desire for overall economic efficiency (read equal outcome). He uses several examples of why this should be done, ignoring entirely the benefit received by the lower rank member by association with the higher rank. He fails to consider equilibrium and routinely places his examples in lopsided stasis which ultimately leads to his argument's failure. In short he picks portions of Darwin theory and ignores others in a failed attempt to argue for redistribution of wealth. The title of this book seems to be designed to bring in an audience that establishes how Natural Selection and Economics meet and why the economy works the way it does. What I found was nothing but a propoganda book for socialism. Every reference to economics in the first chapter is taken from one extreme to the other. "You think government controlling everyone through social engineering is bad? You must approve of murder!". It seems to pick and chose from the edges of economics and then layers it on thick with a massive political agenda. Not a recommendation I would give for anyone who's interested in learning about economics, except maybe to see what incorrect, manipulative and skewed opinions might be brought forwards. I strongly recommend this audio. Not only is it original and engaging, but in his usual lively style, Robert Frank convincingly lays out economic policies that will benefit all segments of society, in a book that is as important as it is timely. Everything was about squashing the individual for the sake of the hive. I'm fairly leftwing, but the total denial of the need for individual liberty horrified me. Frank has come up with the most sensible explanation and most practical solution to our current economic mess. If this doesn't change the way you view the economy and society in general, I would be amazed. If only the people in government would pay attention.